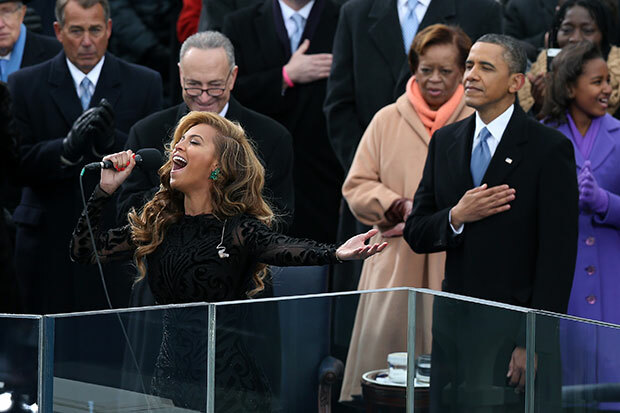 Beyonce singing at Barack Obama’s Inauguration. During Barrack Obama’s Presidential Inauguration, well renowned singer Beyonce Knowles sang the National Anthem – or did she really? Beyonce was caught lip-syncing to a prerecorded track of the National Anthem and has admitted to doing so. After their interview with the Queen B, The Washington Post mentions that Beyonce was worried that she was unprepared for the performance because she missed a rehearsal due to preparations for her Super Bowl concert. It doesn’t seem as if the Obamas cared whether or not Beyonce sang live. However, the public was not as forgiving towards her decision to lip-sync and controversy spurred to question whether she has prerecorded all her performances. This was a strong blow to devoted Beyonce fans and Beyonce herself for she claims that she “always” sings live. Not only does Beyonce put the issue to rest, she also returns to the public eye with a groundbreaking and unforgettable Super Bowl performance. She sang her greatest hits and even reunited Destiny’s Child for one night to please the public. If Beyonce disappointed anyone for lip-syncing the National Anthem, then she most certainly made it up to them. It was not necessary for Beyonce to apologize for lip-syncing. She wanted to honor Obama’s inauguration and making a mistake singing the National Anthem live would have displeased more people than the public finding out that she was lip-syncing to HER OWN VOICE. That’s another interesting thing to look at. It’s not like Beyonce was mouthing the words to someone else’s voice. Other artists lip-sync to other singers’ voices, so why should Beyonce receive the most controversy for singing along to her own? Beyonce singing at her Super Bowl Half Time concert. Unfortunately, after everyone believed that the Beyonce scandal had been put to rest, PETA comes out bashing the singer’s outfit during the Super Bowl. PETA states in an interview with E! that “She’d probably not want to be seen again in anything made of snakes, lizards, rabbits or other animals who died painfully.” Although Beyonce seems to be undergoing a rapid fire of controversy since returning from her pregnancy, she has not let it affect her or damage her career and her fans will continue to support and defend her. These scandals will die out faster than Beyonce’s career, if it actually ever ends.